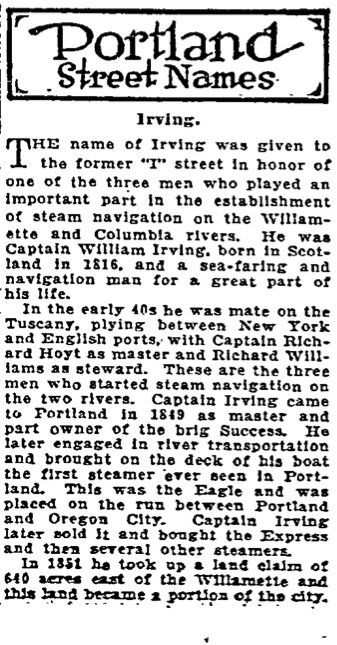 The name of Irving was given to the former “I” street in honor of one of the three men who played an important part in the establishment of steam navigation on the Willamette and Columbia rivers. He was Captain William Irving, born in Scotland in 1816, and a sea-faring and navigation man for a great part of his life. In the early 40s he was mate on the Tuscany, playing between New York and English ports, with Captain Richard Hoyt as mater and Richard Williams as steward. These are the three men who started steam navigation on the the two rivers. Captain Irving came to Portland in 1849 as master and part owner of the brig Success. He later brought on the deck of his boat the first steamer ever seen in Portland. This was the Eagle and was placed on the run between Portland and Oregon City. Captain Irving later sold it and bought the Express and then several other steamers. In 1851 he took up a land claim of 640 acres east of the Willamette and this land became a portion of the city. At this time Elizabeth Dickson, daughter of pioneers from Indiana, was married to him and together they lived on the claim until 1860. There were five children, the the wife of Captain E. W. Spencer being the only one now living in Portland. 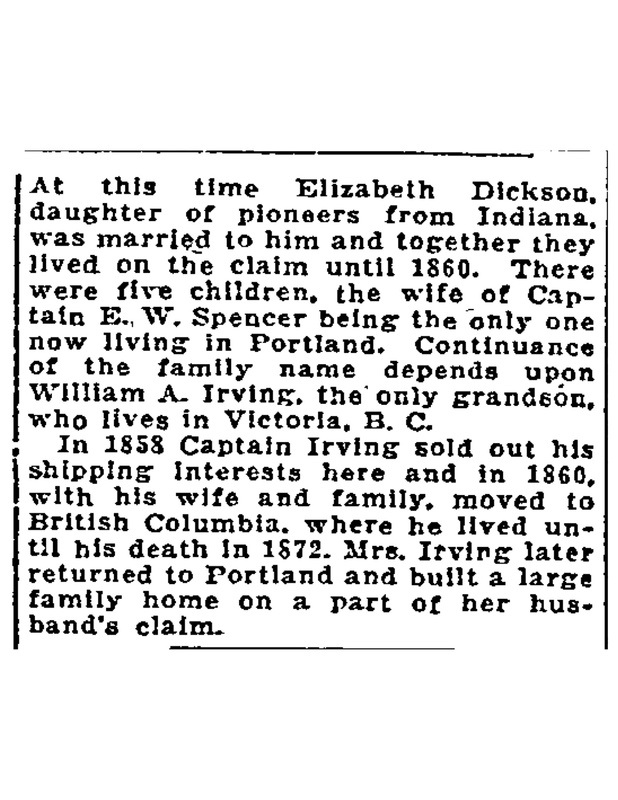 Continuance of the family name depends upon William A. Irving the only grandson, who lives in Victoria B.C. In 1855 Captain Irving sold out his shipping interests here and in 1860 with his wife and family moved to British Columbia, where he lived until his death in 1872. Mrs. Irving later returned to Portland and built a large family home on a part of her husband’s claim. The Irvington Neighborhood and Irving City Park are also both named after Captain Irving.